Saturday, the Prime Minister of Russia, Vladimir Putin, made a motion to return to his old post as the President of the Soviet state once again. Putin was the Russian President from 2000 through 2008. In 2008, due to the Russia rule that a president can serve a maximum of two consecutive terms in office, Dmitri Medvedev became the President for a term. 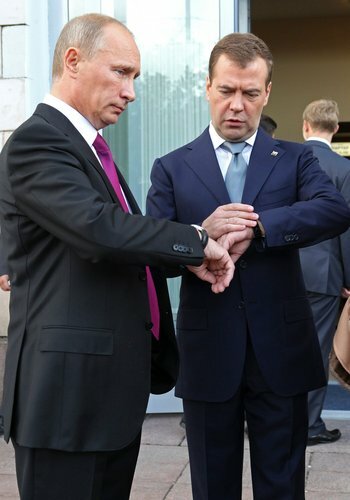 Now, Medvedev is prepared to take the reigns as Prime Minister so Putin can be the President of Russia once more. The election where this switch would take place is scheduled for March of 2012. Putin, who brought the majority of Russian life under control of the Kremlin, was given a joyful response by the over ten thousand in attendance to hear his announcement. According to both Putin and Medvedev, the plan to switch roles had been in place long ago and Medvedev is not being pushed out of his spot, as he has known from the beginning that he was simply holding the spot for Putin. American officials are not worried about the change as since Putin has run the nation through Medvedev for the last three years, the progress made between the United States and Russia has been through Putin’s approval as well.